Designed to be used all over the home, on kitchen benches, fridges, microwaves, tiles, tubs and toilets, this cleaner will leave your home fresh and sparkling clean, naturally. Purifying formula of coconut oil, fresh grapefruit and bergamot rind essential oils. Palm oil free. Large 500ml trigger spray bottle. Buying this product = 20 Reward points for Members. Your cart will total 20 points = voucher of $1.00. Not a Member? Join at checkout to claim these points. 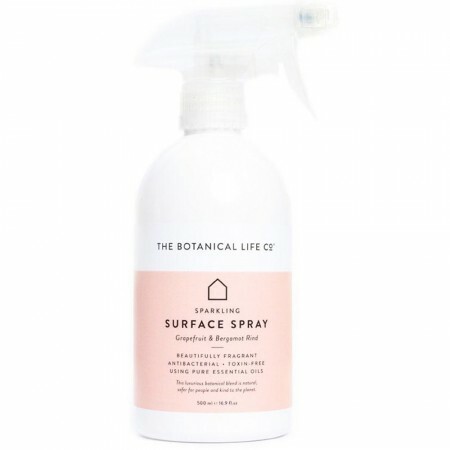 The Botanical Life Co. was established to help people live healthier lives by reducing the toxins they use in their homes and on their bodies. These all natural home and body products are made by hand from their studio in Byron Bay, Australia, using botanical ingredients that are proven to be safer for people and kind to the planet. Designed to be used all over the home. Fresh scent of grapefruit, bergamot and orange. An excellent alternative to chemical based cleaners. Saponified oils - coconut oil, citric acid, pure essential oils- bergamot, grapefruit, sweet orange, potassium citrate, sodium percarbonate, potassium sorbate. 500ml plastic trigger spray bottle.